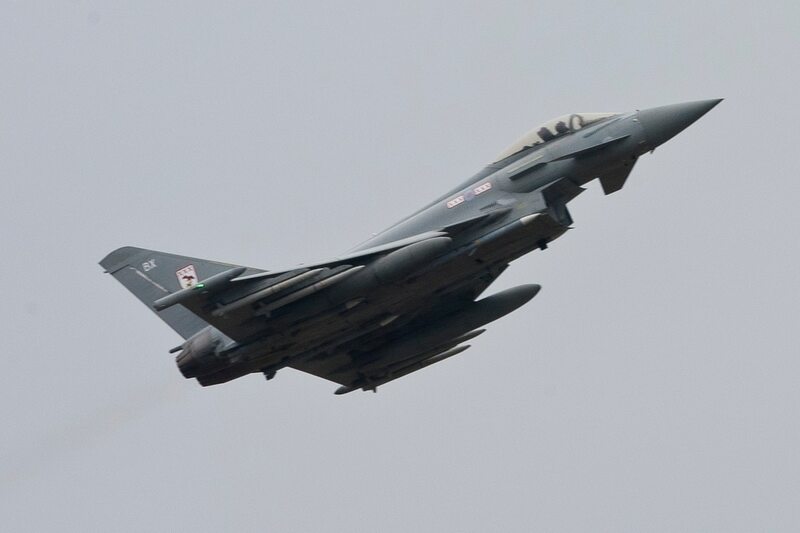 LONDON — Britain has signed a deal with Qatar to supply 24 Typhoon fighters as well as a weapons and training package — the biggest export sale of the jet by the U.K. in more than a decade. Recently appointed U.K. Defence Secretary Gavin Williamson was in Qatar‘s capital Doha on Dec. 10, along with his Qatari counterpart, Khalid Bin Mohamed Al-Attiyah, for the signing of a deal expected to be worth an amount approaching £6 billion (U.S. $8 billion). BAE Systems’ element of the deal, including support and initial training, is worth £5 billion, according to the British firm. The largest export deal on the Typhoon was landed by the British in 2006 when Saudi Arabia purchased 72 of the jets. More recently, Italy secured a major sale for the Typhoon when Kuwait acquired 28 jets. British, German, Italian and Spanish governments are partners in the Typhoon program. The aircraft are built by an industrial consortium comprising Airbus Defence and Space, BAE Systems, and Leonardo. Aside from the Eurofighter Typhoon jets, the Qatar deal includes the supply of a weapons package covering MBDA-built Brimstone 2 ground-to-air and Meteor beyond-visual-range air-to-air missiles as well as Raytheon’s Paveway IV precision-guided bombs. The British Ministry of Defence said in a statement that during his visit, Williamson also agreed to a package of training and cooperation between the two countries’ air forces, which includes training for Qatari pilots and ground crew in the U.K.
Subject to financing conditions being met and receipt by BAE of the first payment, the first of the 24 aircraft are expected to be delivered to Qatar in late 2022. The first down payment is expected no later than mid-2018, BAE said in a statement. The deal with Qatar is expected to keep the Typhoon assembly line at BAE’s Warton, northwest England, site open until 2024. Significant redundancies announced for Warton and elsewhere by BAE in October will go ahead despite the latest order. The Typhoon deal will now see the Qataris operate three top-line fighter types. In the last couple of years, Doha has also ordered Dassault Rafale and Boeing F-15 jets. Last week, France announced it was negotiating to extend its order for 24 aircraft by another 12 jets. The deal comes with Qatar still in the midst of an economic and diplomatic boycott by Saudi Arabia and its regional allies, who accuse Doha of funding terrorism groups and cozying up to Iran. And the deal follows 18 months after the Italian government secured a deal for 28 Typhoons from Kuwait. Qatar will be added to a growing list of Typhoon customers in the region, which also includes Kuwait, Oman and Saudi Arabia. The Saudi’s have the biggest Typhoon fleet in the region with 72 and have been in talks for several years over a further batch of about 48 jets. BAE officials recently told a British parliamentary defense committee hearing that the company was working flat out to land the deal but admitted there was still a raft of issues to overcome. While the announcement is good news for maintaining Typhoon production well into the 2020s, another jet sale to Qatar is on hold for the moment. There was no signature on a contract to buy six BAE Systems Hawk jet trainers that was part of a statement of intent agreed between the two countries in September. The MoD statement said the agreement signed Sunday includes a clear intention to proceed with the purchase of the jet trainers. BAE executives told Britain’s parliamentary Defence Select Committee that the company had already begun funding low-level manufacturing activities for the Qatari Hawk jets at its own risk.